Capcom offers up new and old survival horror fans a chance to revisit the zombie outbreak in Raccoon City with Resident Evil 2. Resident Evil 2 is a full HD remake of the original ‘98 title of the same name, unlike a remaster, which would just be the original game with updated graphics, this game is in its own way a new and original title. While the story of this game shares similarities with the original game, certain characters and plot points are given more focus and relevance due to a change in how video game stories are expected to be nowadays and no longer having the limitations of older hardware. The story of Resident Evil 2 involves two separate characters, Leon S. Kennedy and Claire Redfield, and their struggles to survive in the nightmare that the small mountain town of Raccoon City has become. Depending on who you pick in Resident Evil 2 changes which events and characters that you encounter, Claire will never meet the journalist Ben Bertolucci and likewise, Leon will never interact with the Chief of Police Brian Irons for example. 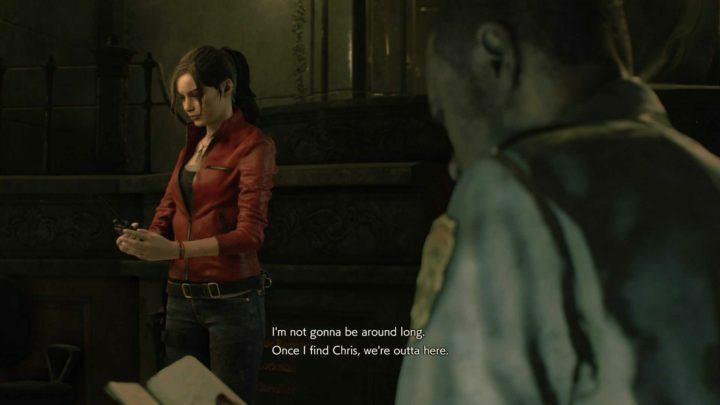 A change from the original Resident Evil 2’s storying telling is that, unlike the original release, in which depending on which order you completed the game changed which bosses each character fought, the remake has set bosses for each character, making so that order changes more who starts where and gives a more concrete story. The gameplay of Resident Evil 2 Remake is more similar in style to Resident Evil 4 instead of the title in which it shares a name with. While the original title was a game in which you controlled characters from a far away fixed camera angle, the remake plays from an over the shoulder third person perspective. This style of gameplay allows for more action and fast-paced combat style of playing, making encounters with enemies like zombies and Lickers much more nerve-wracking and intense as they close the distance on you. Other mechanics in the game are similar to the older style of Resident Evil gameplay, you have limited inventory space, which you can expand with by finding hip packs, and combining and using herbs which you use to heal up any damage you take from the horrors that haunt the halls of the police department and streets of Raccoon City. One big change to the game’s formula is the way in which the Tyrant monster, referred to by fans as “Mr. X”, has changed from his original appearance. In the remake, Mr. X appears in both characters stories and instead of only being a threat in the room he appears in due to system limitations of the time, he is a constant threat, chasing you through the police station only able to be slowed by attacks but never actually able to be stopped permanently. For those who are looking for either a classic horror game or something that will terrify you to your core, Resident Evil 2 is a game that will you with shacking as you experience the horrors so many others experienced back in 1998.